Lake O’Hara weather is similar to other subalpine areas of the Canadian Rockies. The elevation of Lake O’Hara is 2115 metres (6940 feet), meaning long winters and short, cool summers. 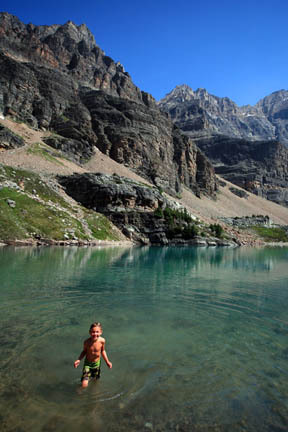 Temperatures in Opabin Lake, high above Lake O’Hara, top out at 4°C (39°F) in summer, but this didn’t stop our children from taking a dip during a recent trip. The bus shuttle begins in spring, usually in mid-June, although at this time of year Lake O’Hara is usually still frozen and smaller lakes at higher elevations remain frozen into early July. The summer months of July and August are the prime months to visit, with wildflowers at their peak in late July/early August. In the summer of 2014, we were lucky enough to be staying at the lake during a “heat wave,” with temperatures reaching 29°C (84°F) – about as hot as it ever gets at the lake. But even on warm summer days, overnight temperatures can drop to 4°C (39°F) or cooler, so plan accordingly if you are camping. Temperatures during September, the first month of fall, are distinctly cooler than summer, especially for those camping, when you can expect frost most nights, and even snow. For many visitors the last two weeks of September, when the forests of larch have turned a brilliant gold colour, is their favourite time to visit the lake. The scheduled bus service ends in early October, by which time larch needles have fallen to the ground and daytime temperatures are often around freezing. In winter, access is restricted to those willing to cross-country ski along an 11-kilometre trail linking the Trans-Canada Highway to Lake O’Hara. Accommodation in winter is at the Alpine Club of Canada hut or between late January and early April at Lake O’Hara Lodge.